Are you looking for a way to spruce up your home without depleting your savings or retirement fund? Are you interested in changing the look of your home to a more elegant, modern, or vogue fashion? One idea that will update your home, practically overnight, is to update the lighting. Changing the light fixtures or lamps in your home can provide you with a fresh, new look and it can also change the ambiance of a room completely. In addition to switching some of the fixtures and lamps, you can also add some new light fixtures to your home. Perhaps light up a corner of a room that has been too dark previously, or maybe add some picture lights over a favorite piece of art, or some sconces around the doors or the fireplace. There are some modern techniques for lighting that can really add to the functionality of a room. For example, in the kitchen many homeowners are adding recessed lights in the ceiling, for more of a spotlight look over the kitchen island, stove, sink, or refrigerator. Track lighting is also very popular in the kitchen because it provides a lot of focused light so you can see well as you are preparing your meals. Under cabinet lighting is also quite nice in the kitchen. This type of lighting provides bright lights at close range so the counters are easily visible, and it also provides a nice, nightlight effect when used alone. Another idea is to create a cozy, functional reading corner with a bright floor lamp by your favorite armchair. This would provide for a wonderful area to sit and focus on a newspaper or an interesting book. Some people find that decorating with string lights can really brighten up a room. The string lights can be placed on an indoor plant, across a mantle, or over the tops of furniture or windows. In addition to indoor lighting, outdoor lighting can also be updated and can be very attractive and functional. There are many options available for lighting the outdoor areas of your home. Landscape lighting is very popular and beautiful, with lights that focus around trees and bushes. Walkway lighting is also nice because it provides lighting throughout the evening and gives the sidewalk or driveway visibility. Floodlights are another nice addition to outdoor areas. They provide a lot of light on dark nights. 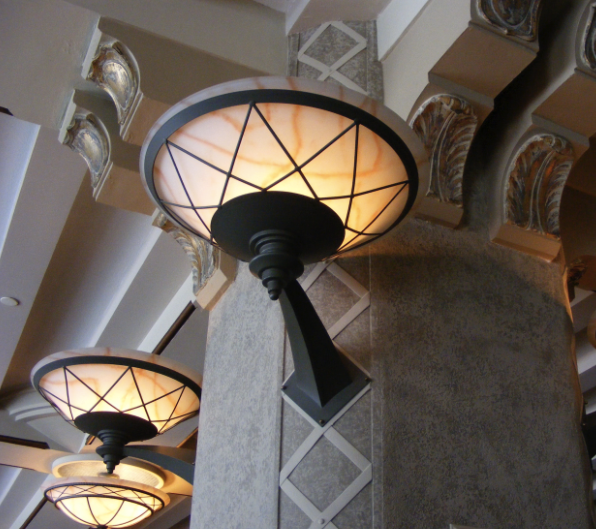 There is such a wide range of things you can do to update lighting in and around your home. The options are endless and the price range is very broad. A good place to gather some ideas is at home supply stores, furniture stores, design warehouses, or by searching online. Whichever choices you make about updating your home, good lighting fixtures can add value, functionality, and aesthetic beauty to any room. Once you have chosen some new lighting elements for your home, be sure to contact an experienced electrical contractor to install them for you. Working with electricity can be dangerous, not only to yourself, but to your home, if you are not trained to do so.